Aren't you proud of me? Here it is Friday, and I'm actually putting up a Friday Roundup! On a Friday! Friday Roundups (regardless of what day they're posted) are posted so we can all check in on what steps we've taken, big or small, to inch us incrementally toward greater preparedness. • I wrote a WND column on why prepping is still important despite Hillary's defeat. • A bunch of us teamed up to help get a neighbor's vehicle out of the snow (no photos, sorry). 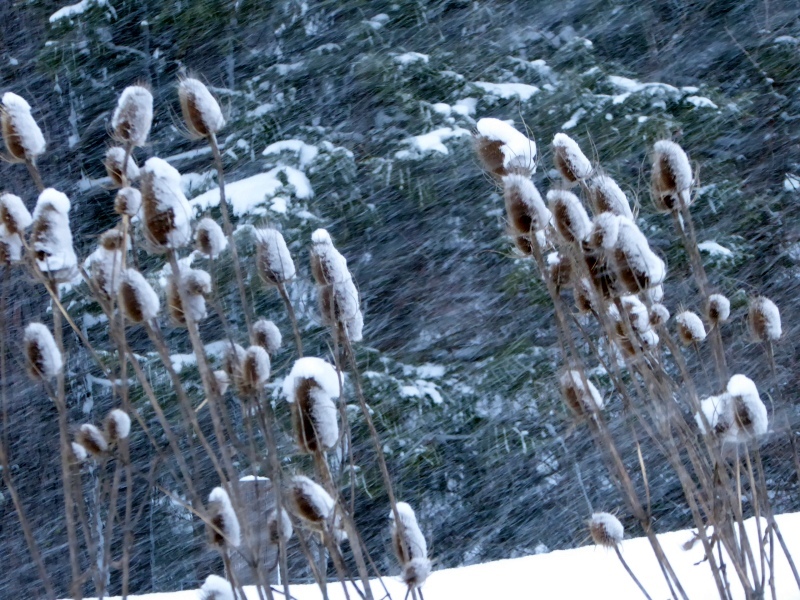 March roared in like a lion with 30 mph winds and snow, which built drifts three and four feet high across our road. Neighbors got together with a snobmobile, shovels, snow blowers on a tractor, and finally a bulldozer to get the road cleared. Community, the third leg of preparedness! • I did a webinar with The Survival Mom as part of her Prepper's University "Advanced Intensive" series. The subject, of course, was homesteading and self-reliance. ...and got about half of them burned in the burn barrel. Some of the stuff we had packed away was absurd. 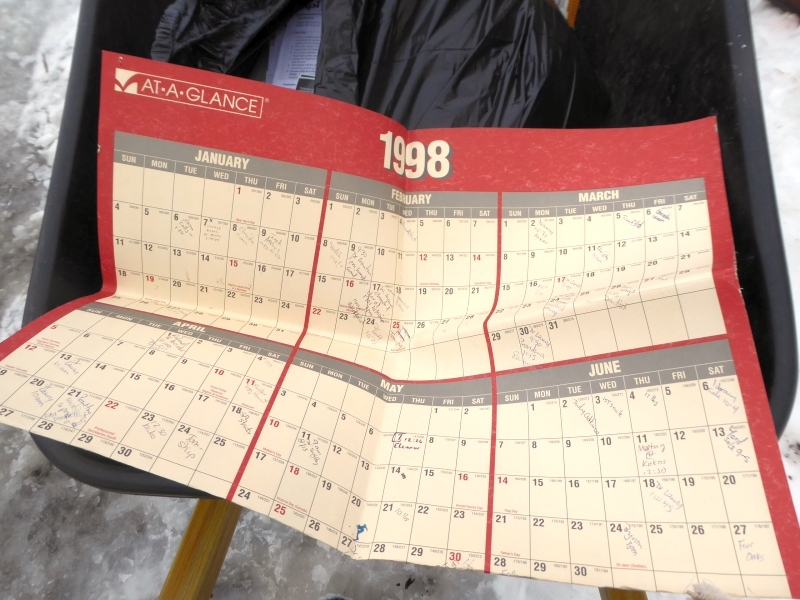 A wall calendar from 1998? Oh puh-lease. We probably had 150 lbs. of old papers to burn. Didn't get to all of them, but it's a start. 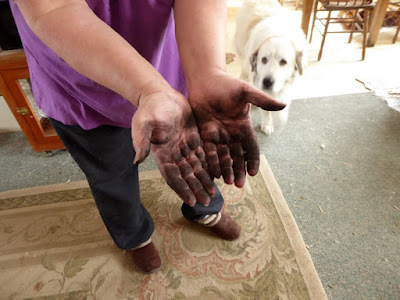 • Our wood cookstove started smoking and not drawing properly. 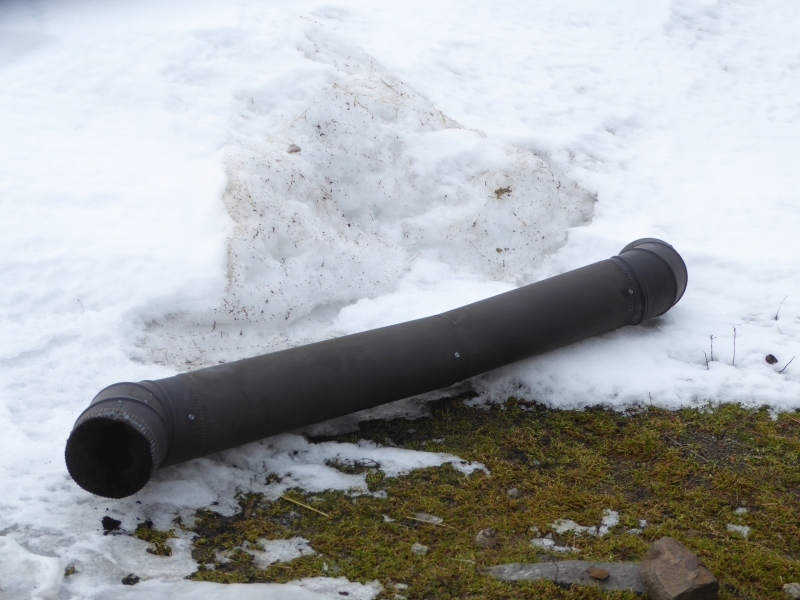 We suspected the stovepipe was due for a major cleanout. We just didn't realize how bad it was. 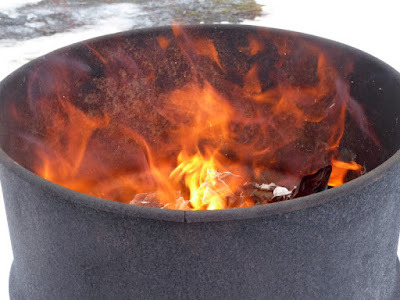 Earlier, a reader asked why we didn't burn the purged papers in the cookstove. 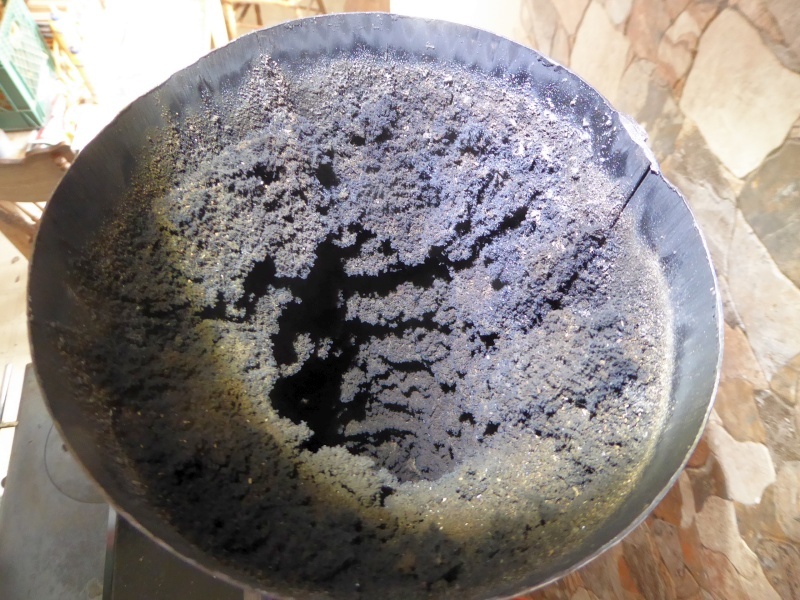 The reason is because it builds up ash in the pipe like crazy. Cleaning the stove is dirty, but obviously necessary. And once it's cleaned out, there's no finer way to both cook and heat the house than a wood cookstove, in my opinion. • I went through the girls' old doll clothes, which had just been tucked in an open-topped box and so had mice poo on them. I washed everything (including some of the cloth dolls) and scrubbed down the plastic dolls. I'll pack everything away in a mouse-proof crate after this. Some of these dolls' clothes were made by my mother with the girls were young. Others I wore when I was an infant, or when the girls were infants. Preserving childhood treasures is, we feel, important. 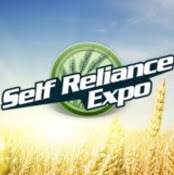 • I tentatively -- and that's tentatively -- plan to be at the Self-Reliance Expo in Denver in September. That's tentative ... or did I say that already? So that's our roundup over the last two weeks. What has everyone else done, big or small, to increase self-sufficiency? -A friend was cutting some trees and found a hive of bees in a large limb they cut down. We rescued the bees, huge limb and all, and relocated them. They replaced the ones we lost last month. I know this is the wrong time of year, but here’s to hoping they make it. -We started the first of the garden prep. (My husband ripped the ground.) The tomatoes were the first to germinate and are growing well, as are zucchini, both cabbages, yellow squash, and brussell sprouts. -Last week I made a comment to someone on another blog about a local prepper business owner who was way too nosey for my liking. He wanted to know too much about my preps. (Where do you live? What water sources do you have? Who’s in your group? What/how much food to you have stockpiled? Do you have any guns and ammo? What kind of water filter do you have? Etc.) I was vague and even misleading because I suspected that at the very least he would open his big mouth to others. Well, I was right. He sent an email to a huge number of people naming a woman in his group who had storm damage to her home. It wouldn’t take much to find out exactly where she lives. She was featured in the local news, but her prepping was NOT mentioned. Now we all know where to go for anything we need. I was right in not joining with him and not telling him anything. -I’m still recuperating from the flu, and finally had to go to the doctor. -We had tornadoes in our area, but we were spared and are thanking God for protecting us. I really enjoy reading what each of you has accomplished. It is inspiring. Blessings to all. 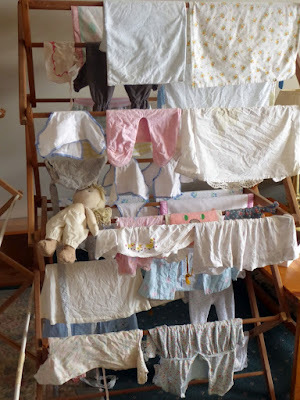 Almost all of my dolls cloths were either made by my great grandmother, or had been worn by my mother or myself. Very special treasures indeed. As for round-up tasks I've been scratching my spring gardening itch a bit early (which thankfully is OK here in southern Ca this time of year). I've placed and received nearly all my seed and bare root orders for the year. I've started a new large raised garden bed and have planted about half of the 15x30' space. I've also prepped where my forn will be going, planted some tomatoes, a rhubarb patch and 25 bare-root strawberries with an additional 10 plants to go. I will also be adding an asparagus bed this year which I am extremely excited about. I got my other cool weather crops in as well, Brussels sprouts, broccoli, beets, carrots, chard and peas. I have also joined a newly formed local group of like minded men and women to discuss homesteading and simple living topics. Oh, I got my garlic in as well about a week ago, so it will be a real roll of the dice to see if they do anything or not. Whoa - that stovepipe! What kinds of wood are you burning Patrice? I hate to sound like braggin', but we had our chimney inspected after 5 years of burning with no cleanout. The guys climbed up there, then promptly climbed down. "It's clean", they said. I had to see more myself, but sure enough, the sides were lightly "dusted" with ash. Couldn't believe it. 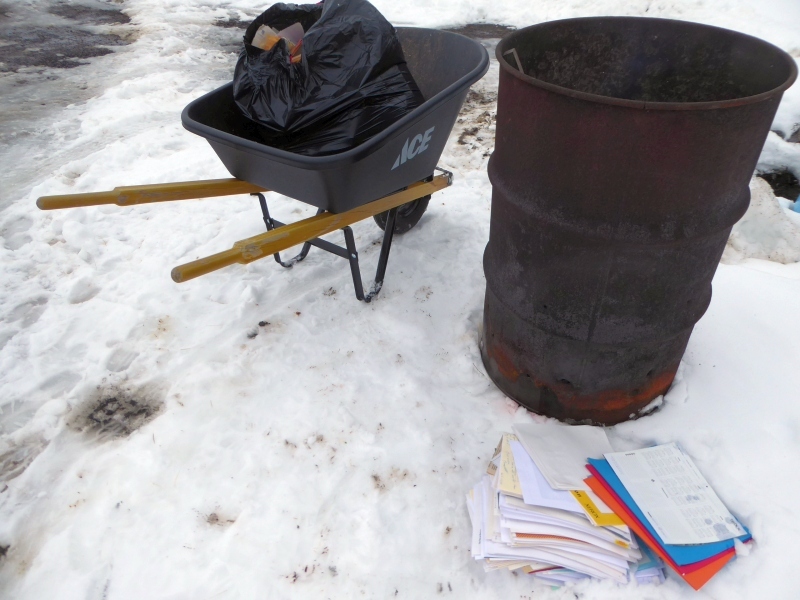 I use old papers like that, and newspaper, for kindling, then burn birch, spruce and cottonwood. I like to burn HOT and don't turn down the air/draft until I have a good bed of coals. My father passed on to his reward recently, and my mother is in nursing care. I've been doing their paperwork, managing their accounts, paying their final taxes and disposing of their households lately. My son had a new son recently, so while I'm ushering out the old lives I'm welcoming in a new one. 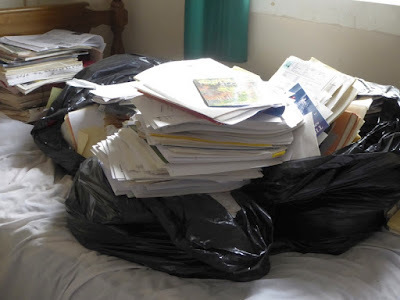 Stuck in the middle, things like decluttering my own life is not in the schedule right now. But in my heart I'm gearing up for spring right along with the rest of you. Planted more cool weather veggies. Fixed my washing machine, set up a hang-dry system in the utility room. Turned a neighbor on to my frugal laundry detergent (drop of Dawn liquid, half c Borax,) Bought a like-new bread machine at the thrift store ($5.00) and made bread. Bought more shelves for pantry and did some further organizing. Did NOT go grocery shopping (2x month my limit) Made list for next trip. Dittos on the chimney comments. My folks heated a large house in Minnesota for years - mostly with wood. Once a month mom would sew an elastic band into a garage bag and dad would climb up and scrub the chimney down into the bag slipped around the pipe opening above the stove - it was a regular scheduled chore. Mostly just keeping my seedlings going and starting more. Another busy weekend coming up, but it's going to be warm enough to set up the greenhouse this weekend. Grammy, we have some people like that around here, too. Thankfully, we also keep a low profile. Here in North Carolina it seems spring has sprung a month early. We've had record temps with some days in the upper 70s. However, tonight (March 3rd), we're having a hard freeze with temps in the mid 20s. Covered the 2 year old peach trees with tarps and covered the strawberries, too. Blueberries, grapes and 2 year old pecan tree haven't sprouted any growth yet so left them uncovered. My raised garden border was rotted and fallen down so replaced it with new 2x6x8 treated boards. Also took a page out of your playbook and setup three tractor tires for raised strawberry beds. Last year they were on the ground and got infested with crabgrass. One other project was building a raised bed for peanuts. I also walled my two grapevines with lawn bricks. Next week begins my wildflower (bee food) tractor tires raised beds project. The raspberries have little green shoots starting and the jonquils are in full bloom. My arugula is in full bloom too and parsley, onions and celery made it through the winter. Go figure! NC here also. Planted potatoes, carrots, beets and finished up onion and leeks. Pruned blueberry bushes blackberry vines. Planted dill and cilantro seeds. Built a 2'x40' raised bed for raspberries which will go in the ground next month. Still have to replace 4 blueberry bushes and plant some elderberry bushes. Snow peas are growing good now. Finally finished my planting calendar and laying out the back garden. I move it around every year. My spouse redid ALL the hydrolics on our 1952 Oliver tractor. Ready to go tomorrow after a year of non-op after installing new battery. Yay. No more hand-shoveling the cow lean-to. Put in a large seed order. Went to stock up on chicken feed and ended up prepurchasing 6 chicks. Later called them back and reserved a seventh chick I will pay for when I pick them up in a few weeks. One kind I am getting is a straight run, so we are hoping for at least one roo and one hen (out of a total of 3 chicks). Just moved to the country a few months ago and we couldn't have a rooster in the city. Hoping to try raising my own chicks and selling them. Also hoping to sell the extra eggs. Started brassica veggies, herbs, tomatoes and peppers. Picked up a few more seed packs with the chicken feed so I may start some more herbs and flowers. Nothing has sprouted yet, but it has been less than a week and most seeds are winter sown in containers outside. Started a garden log to encourage myself to keep a written record of dates planted, amount of produce etc. Reread David the Good's instructions for starting peach pits and placed the kernel from 3 or 4 peach pits in wet potting soil in the fridge. They will need to a few months to sprout. I bought a new place because it had 16 4X4 raised beds. I am taking a trip next Friday for a week so haven't even started my seeds. We are going fishing in the morning and cleaning the raised beds in the afternoon. I haven't placed my bareroot order yet. I am in zone 6 and even though it has been a really mild winter, it can still freeze. I'm in zone 6 too. It's tempting to start planting outside, but we both know it's too early. This nice weather has me SO anxious! Our prepping looks much different than it did 8 months ago. I am now prepping for the the possibility of losing my husband and having to go it alone. He was diagnosed with brain cancer back in the fall, the deadliest kind. Chemo seems to be working, but we know the reality of the survival rates. So our/my "preps" are much different. This week we worked on finances, going over accounts, etc. and tossed a bunch of stuff that we had in storage. Right now he is responding well to chemo, and hopefully will be able to take a break from that in a few months. As the old saying goes "prep for the worst, hope/pray for the best." Just a reminder that your "SHTF" moment could be much more personal than a big world wide event. LB, I can't tell you how sorry I am to hear this. I pray for the best for you and your husband. You might take a peek at the webpage of a friend (Cheryl Broyles) who is a survivor of a GBM tumor (it's returned six times, and she’s survived every one). Her life mission is now to encourage and support others with similar diagnoses. Feel free to get in touch with her – she might be able to offer recommendations for different treatments. My prayer is that your husband receives a complete healing, and that you have comfort, strength, and support during this difficult time. We have read her site and it is great. Right now the hope is they caught it so quick (due to a benign brain tumor dh had about 6 yrs ago he gets MRIs every 6months). My purpose in posting was not to gather sympathy, but to remind others that while we prep for the big "world events" that MIGHT happen, we need to prep in other ways too. Ladies, if you don't take care of the bills, be sure you know how to do it! If you don't have your dh's log-ins for the computer (and any accounts) be sure you have them. Get all your wills, investment papers etc into one place, so should the worst ever happen to your spouse, you will know where it all is. Develop a network of people you can rely on. And I mean TRULY rely on. Learn skills if needed. Do it in calm times, that way when the storms come.....you won't have to worry about those things. Found 2 boxes of .44 mag at Wal Mart. They are Winchester white box and I am trying to standardize on those as the trajectory with that round in my carbine is a rainbow. I have tried reloading some to get the same trajectory but am pushing the max load and am still about 4" low at 100 yards. I wonder what their load is? Made a metric key for my 3/8" drill that fits into the manual hex opening in my wheat grinder. That made that job much easier and quicker. I have seen no impact to the grinder (it does not get hot or even warm) so I will see if that will hurt it in the long run. Got the 1/2 acre corn plot rototilled. I am going to try some millet and daikon radishes too. Spot on article, as always Patrice. I had my personal TEOTWAWKI a few years back when I lost my job. It has been rough, but the preps I had helped us through. It's been tough building back up. I admit I had a sigh of relief when Trump was elected, but I also realize the cluster he inherited isn't going away soon. Neither are those who are opposed to him. So we keep on carrying on. Nowhere near as prepared as we need to be, but working towards it every week. Unless, of course, there are no other woods to burn. North Idaho has very few deciduous trees. We burn tamarack when we can (cha-ching!) but otherwise take what we can get. Please be careful, clean chimney at least once a month. We love you guys. Dang! Freight train of a chimney fire waiting to happen. Been there-almost put me off woodburning cook stoves. But 40 plus years later I love my little Sweetheart. Learned a few tricks over the years. Burn what you have, try to use dry wood, open the damper when the coals are hot hot. Some people I know open the damper at bedtime and let the hot heat burn the creosote to ash. 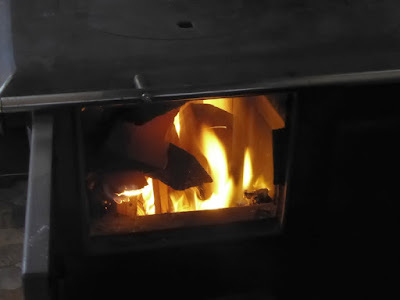 I try to clean around my oven box once a week or two-also do the opposite and close the damper some to get the oven real hot, burns the remaining creosote around the oven to fine ash. My husband always knows what I'm up to when I yell "I need small wood!" The only down side to the Sweetheart is the $ of replacing the firebricks-have only done this once. The $ really hurt. I'll take any hints I can get. Tomato seeds are up here in Northern California, snowing like crazy. Cheers to all of you homesteaders. Tips: Firebricks are relatively fragile. I tried purchasing online (Amazon) but every time some of the bricks broke during shipping. I finally smartened up and purchased the same bricks at my local ACE Hardware. No more damaged bricks! You will probably have to cut some of your bricks. They can be cut with a circular saw using a inexpensive masonry (concrete) cutting blade. Try to clamp them down and wear gloves. The trick is to SOAK THE BRICKS in water for a couple hours before cutting. We are in the same boat with firewood. Pine and occasional cedar so we make sure to get a hot fire going for the first 15minutes every morning, especially if the stove was banked for the night. Helps burn out the creosote. I sure do miss that wonderful oak wood we had in California.....but not the weirdos that live there. Put up 10qt's of pasta sauce , worked at purging the craft room ( a life time project )hung the pot rack so I have more room for my caning projects and obtained 10oz of silver.